What does the expression “comfort food” mean to you? Is it the enticing whiff of a tray of chocolate chip cookies emerging from a warm oven? The aroma of homemade chicken soup simmering in the pot? Or could it be the heady scent of deep-fried goodies fresh from the fryer? When I was a kid, I was probably one of the pickiest eaters on the planet. (There are those who will tell you I haven’t changed, but don’t listen to them . . . they’re just trouble-makers J) The hit parade of foods I liked consisted of toast with butter, grilled cheese or peanut butter sandwiches, macaroni and cheese, and spaghetti with plain tomato sauce. Oh . . . and chocolate. How I loved my chocolate! I suspect many of my childhood favorites are among yours, too. So how did I go from turning up my nose at nearly everything to writing a cozy series about an eatery that specializes in delectable, deep-fried fare? It starts, I think, with one basic concept—any food that’s been swirled through batter and fried in sizzling hot oil can’t possibly be anything but scrumptious! When the Deep Fried series begins, the eatery featured in Fillet of Murder is pretty much a fish and chips shop. Swish a slab of haddock around in batter, plunge it into the deep fry, add some crispy, hand-cut “chips” and a side of tangy coleslaw, and you have yourself one heckuva delicious meal. 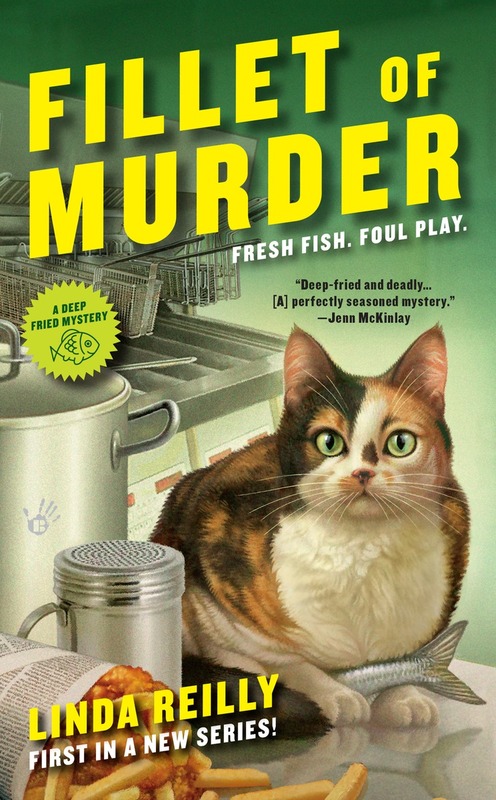 But in Fillet of Murder, a happy accident occurs. A common side treat offered in most eateries finds its way into the batter, gets fried up nice and golden, and then gets eaten by an unsuspecting character. His first reaction is horror . . . until he pauses to savor the taste. With that, the eatery’s menu begins to morph from primarily fish and chips into one that offers a variety of deep-fried side dishes. But it also means that my main character, Talia Marby, has to scramble to dream up some new deep-fried recipes! Guess who has to help her? Yup. Me. After a lot of brainstorming, Talia and I came up with some fun, deep-fried side dishes. Deep-fried meatballs drizzled with marinara became one of the first concoctions, along with deep-fried pickle rounds. There are so many more recipes to explore. Gradually we’ve been plumping up the menu, but the possibilities are endless. So tell me, what are some of your favorite comfort foods?